Last night, an awesome friend of mine organized some of us crafty folks for wine and spinning/knitting. I know she read my burnout blog post, I suspect she was trying to get me moving on spinning again. The first thing I've spun for months. It worked. 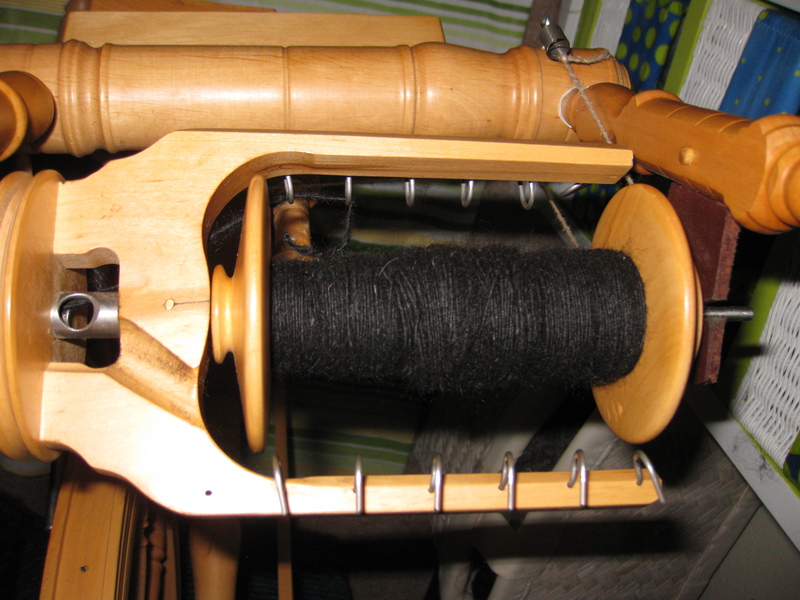 I have finally gotten started on spinning to fill the orders I have. Thank goodness. I was starting to worry I’d never be able to look my wheel in the face again. It also got me thinking about spinning in groups. I know that you don’t actually need someone else to accomplish the task of spinning, but I also know that it was not a solitary pursuit in the past. And I can’t help but be a bit wistful, because the idea of a bunch of women my age spinning and talking over wine sounds worlds better than spinning while watching Family Guy reruns. It must be the gloomy weather, which us Coloradoans are ill-equipped to cope with, but I’m fighting a desolate, pit-of-my-stomach emptiness that feels like loneliness. This entry was posted in fiber art and tagged gloom, handspinning, handspun yarn, loneliness, rain, spinning, spinning clubs. Bookmark the permalink.